Getting back into it. I used to want to be a professional clown. I had posters of some of the original barnum and bailey's clowns. Can't remember their names, but I was so passionate about it. 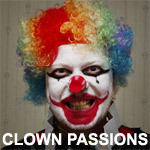 Would love to see clown lover's and meet up.